More and more people in today�s society want to respect the environment and go �Green�. We like to consider ourselves as part of this group. At Solid Builders we make a point to recycle as much as possible and offer our clients green alternatives. First of all, choosing to renovate your home is an environmentally friendly decision. You can reuse existing resources and help preserve undeveloped land. There are many simple, Do-it-Yourself tasks as well as projects you can do with the help of a professional to make your house more comfortable, save money on utility bills and improve your property value. As we researched the many available resources on �Green Remodeling�, they all talk about the same things�conserving energy through installation of new windows, buying energy efficient appliances and lighting. These are all great ideas and we will discuss them later on in this article. However, at Solid Builders we like to take it a step further and institute practices that reuse your existing home materials instead of buying new and use recycled materials. Let�s face it, if you are buying new then you are creating more waste and filling up our land fields. Before you go out and buy new kitchen or bathroom cabinets consider giving your existing cabinets an up lift. You can reface your existing cabinets or put a fresh coat of paint on and replace the outdated hardware. Reuse & Recycle. Visit your local Habitat for Humanity store to shop for materials and or take your old materials there for someone else to use. Fix existing windows. Don�t be so quick to replace your existing windows. Try improving their energy efficiency through sealing with caulk and adding weather stripping; use storm windows during the winter months. Make temperature adjustments to refrigerators, freezers and hot water heaters. Install a faucet aerator. This will reduce water flow from the tap by up to 50%. Replace old shower fixture with a low-flow shower head. Make your toilet green. You have three options. 1. Install a dual-flush toilet which has different water usage for liquid or solid waste. 2. Install a new toilet with a smaller reservoir tank. 3. Most older models do have adjustable tank levels so adjust your old toilet to use less water. Install skylights to let natural light warm an area and reduce the use of electricity. Change old bulbs for CFLs (compact fluorescent lights). Consider a tankless water heater. They heat water only as it travels through the pipes. Or, keep your old water heater�insulate the pipes and decrease the desired temp to 110 degrees. Green Countertops. Select glass, tile or recycled ceramic or concrete. They are locally available thus use less energy to ship them, and are more environmentally friendly because they have not been quarried or use energy expensive processes to be made. 1. Bamboo�it grows quickly and doesn�t require replanting or pesticides. 4. Concrete with an attractive finish�concrete absorbs heat, especially from in-floor heating thus reducing your heating bills. 5. Recycled Flooring�recycled rubber can be finished in a way that makes it a good replacement for linoleum. Or, recycled tile and ceramic flooring can give you the look you want without the energy consumption of original tile or ceramic flooring. Green Painting Options�Use low- or no-VOC paints or natural paints, made from plant dyes, clay, beeswax or natural latex. Green Tax Rebates�The best news in green remodeling is that new tax credits are available for homeowners. Insulation�If your home was built before 1970 chances are there is no insulation. Adding insulation to your home will increase your homes energy efficiency. Have a contractor check the R-value of your insulation to make sure the ideal value has been used. Make sure your attic is insulated. Caulk any cracks in your exterior and around the window and door frames. Install gaskets under cover plates to prevent leaks at electrical switches and outlets. Weather strip around window sashes and doors to tightly seal your operable units from wind and water infiltration. Paint walls a light color. A white wall reflects 80% of the light that hits it while a black wall reflects just 10%. Replace your old appliances with newer Energy Star� rated appliances. Change your light bulbs. Switch from an incandescent bulb that uses at least 66% more energy to an Energy Star� qualified compact fluorescent lamp (CFL) or fluorescent tube. They no longer have the buzzing and poor color rendition of the previous generation and last much longer. Another option is a low voltage halogen fixture, which would use less energy per watt to achieve the same brightness as a incandescent. Install devices to reduce usage. Motion sensors are a great way to ensure that lights are only used when needed. Use timers or photocells to control your existing outdoor entry lights. Solar L.E.D. lights are great for path and spot lights. Create your own power. Install photovoltaic panels to generate electricity from the sun�s energy. They can be mounted on your roof or as part of your roofing shingles. There are federal and state tax rebates too. Refrigerator . Can you believe 9% of your home�s energy use is for your refrigerator? Here are some things you can do to trim the amount of energy you use. 1. Replace your old refrigerator. New units use 50% less energy. 3. Set the temperature to the least cold setting. Raising the temperature 10 degrees will save 25% in energy consumption. At first glance, green home remodels can appear expensive. But when you consider the money you will save in the long run on bills plus possible tax rebates, not to mention the peace of mind of being environmentally friendly, the change is completely worth it. 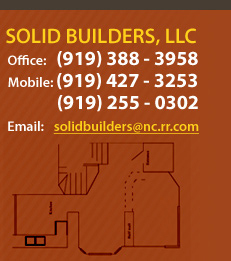 If you have any more questions about home repairs Raleigh or a basement remodel Cary please give us a call.  I can never fully express how grateful I am to you and your team for doing all the work you did for me, for doing it so well, so reasonably. I enjoyed, so much our working time together. Thank you.